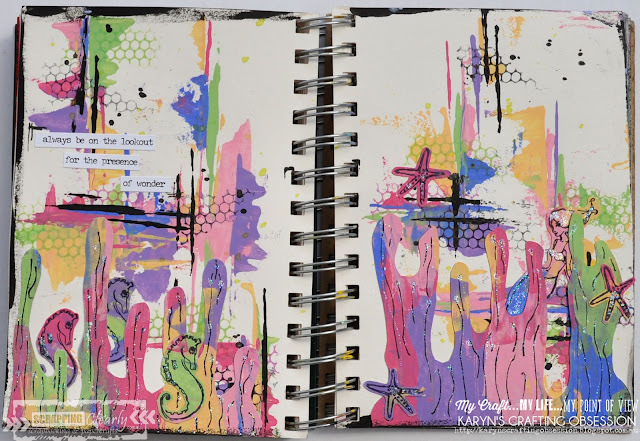 Scrappingclearly Scrapbooking and Papercrafts: Art Journalling - With Karyn Schultz! 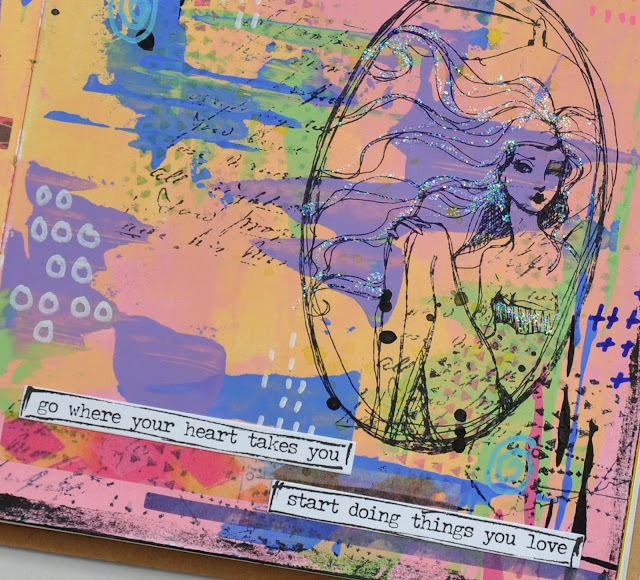 made using lots of fun products available in the Scrapping Clearly Store. I love art journalling. 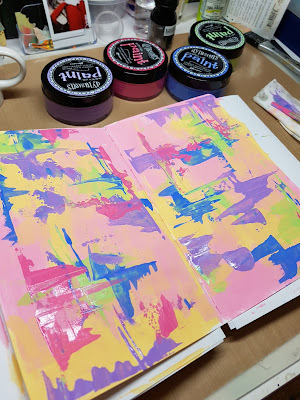 I love that there are no rules and that I can experiment with techniques before applying them on a scrapbook page. I love looking at all the wonderful masterpieces that other art journallers create. I struggle at times though with finishing off my pages. I love to work on the background but then I struggle with the "final layer". 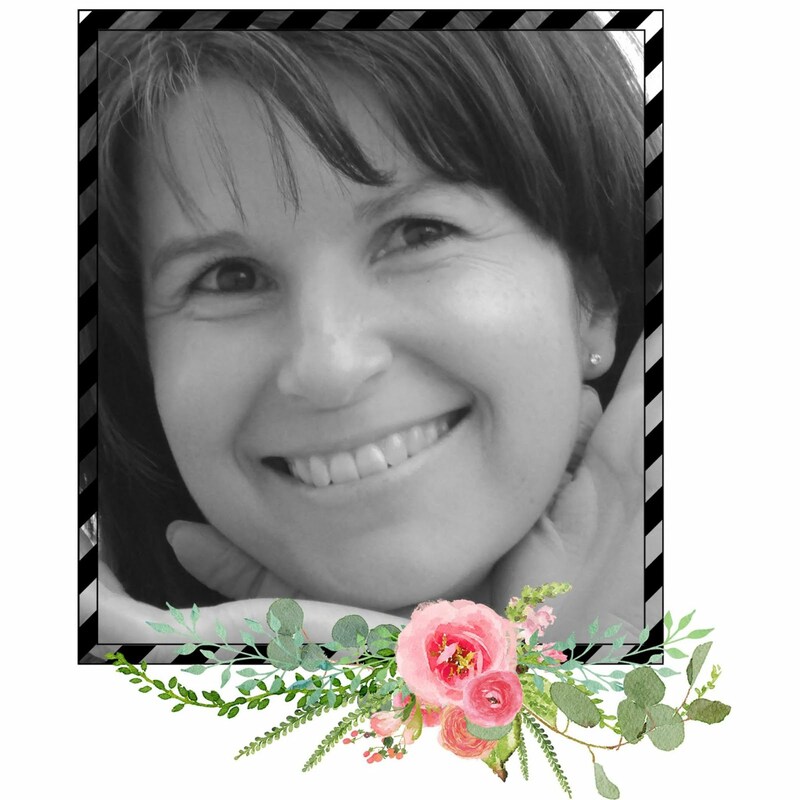 In scrapbooking you have a photo - now I need some other element. I think that part of my problem is that I love the background and dont want to cover it up!! 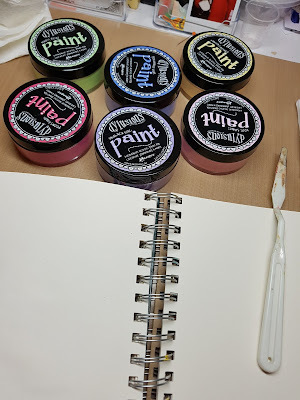 I recently purchased the 6 newest Dylusions paints (Peony blush, Mushy Peas, Laidback Lilac, Periwinkle blue, Vanilla custard, Rose quartz). Initially I wasn't sure of the colours. They seem quite pastelly compared to the other colours in the range - but I now LOVE LOVE LOVE them!! 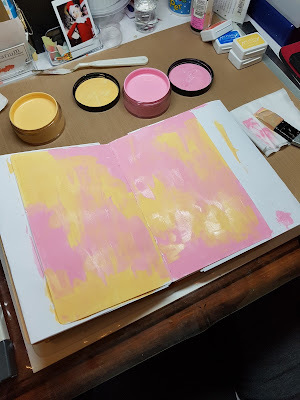 I started by using a spatula to apply them to my pages. I started with the lightest colours and worked my way through to the darker colours. Then I used an old credit card to add some black paint swipes. 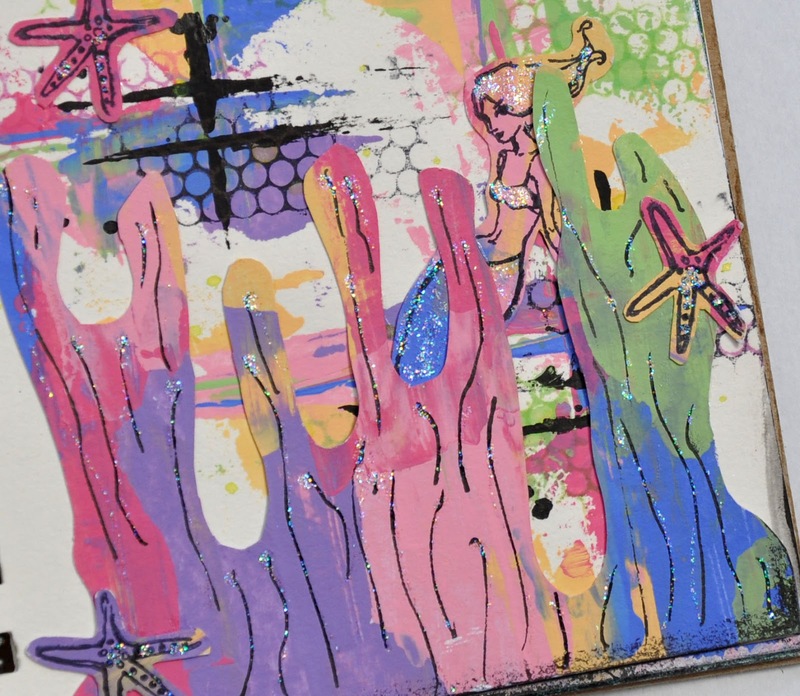 When this was all dry I used a honeycomb stamp with Ranger Archival ink pads (black, green and pink). 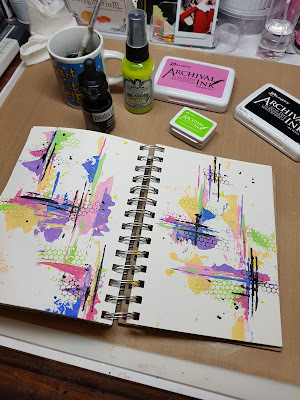 I'm loving using Archival ink pads at the moment as they are permanent ink and perfect for art journalling. 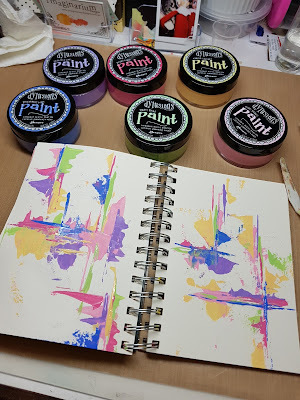 Next I added some splatters of carbon black Liquitex ink and lime Tattered Angels chalkboard glimmermist . 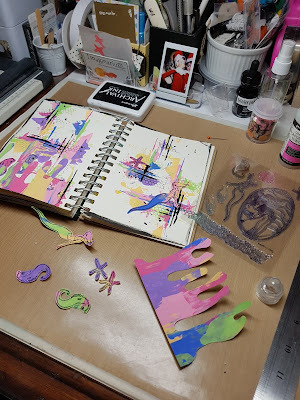 Next I stamped a variety of Jane Davenport Mermaid stamps on a scrap piece of paper that I had been swiping excess paints on. I cut these out along with a seaweed shape to place on my page. Here is my finished page. I also added some Tim Holtz small talk stickers - my fav stickers!! Here is a close up of my mermaid peeking out from behind the seaweed. I also added some sparkly glitter glue in places. Since I was having so much fun with these colours I made a second page. 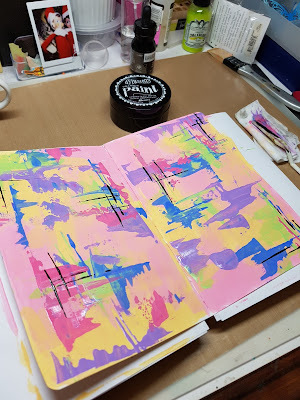 This time in my Small Dylusions journal. I started by covering my pages with the Peony blush and Vanilla custard Dylusions paints, then adding swipes of Rose quartz, Mushy Peas, Laidback Lilac, and Periwinkle blue. Then I used an old credit card to add some black paint swipes. 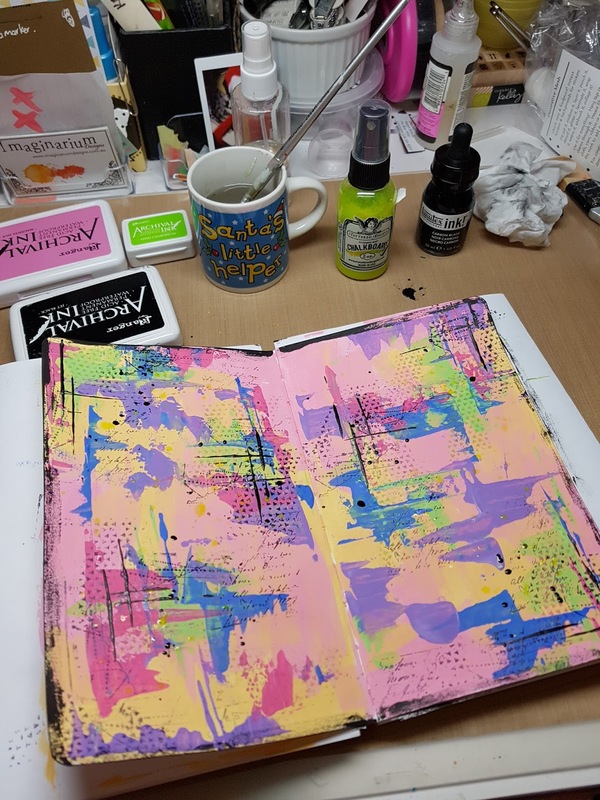 When this was all dry I used various stamps with Ranger Archival ink pads (black, green and pink). Next I added some splatters of carbon black Liquitex ink and lime Tattered Angels chalkboard glimmermist . Next I stamped a Jane Davenport Mermaid stamp on my page and highlighted parts with sparkly glitter glue. 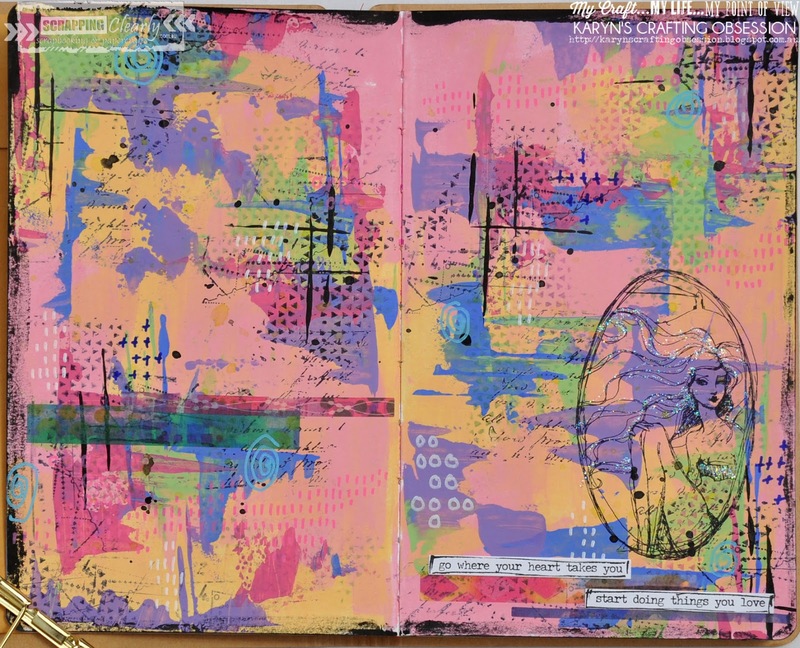 I added some Tim Holtz small talk stickers under my mermaid then added some marks across my page with Posca paint pens.